We’ll debark and set up camp at this planetary neighbor, which is located near a familiar extragalactic nebula, about some 5 billion light-years away from Planet K. Ampere is a pulsating interstellar metropole that attracts many voyagers who are traveling the cosmic sphere. Its size, mass, ecosystem and life-forms are quite comparable to ours, and appear to have been formed at about the same time as our beloved Planet. We’ll provide exclusively otherworldly techno. Expect shimmering sound-waves that are both dark and nuclear as raw and thriving. Bringing together his melodic grooves, beat tracks as well as straighter cuts, Marcel Fengler founded his own imprint ‘Marcel Fengler Index’ (IMF) in 2011 – a platform that not only continues to evolve his own timeless techno approach but is also a creative center for new and young talents. As a DJ and producer, Marcel Fengler stands for variety and surprises. For him, techno is an unconditional passion as well as an essential part of his identity. He’s not bound to a linear or one-dimensional sound, instead, he’s constantly seeking for new ways to express his emotional storytelling skills. Marcel Fengler is without a doubt one of today’s most exciting electronic artists, and we’re very honored to welcome him to our Kozzmozz-stage once again. Since his earliest productions, Amsterdam’s electronic music pioneer Steve Rachmad has created a legion of monikers for his various compositions. One of the main characters living on Planet Rachmad has always been STERAC: a side of Steve’s musical personality that’s not easily described. Let’s say that where other aliases are used for excursions to more dub-, disco-, or house-oriented records, Sterac’s focus has always been on the no-nonsense, darker and deeper side of techno. The Sterac discography consists of classic tracks on labels such as M-Plant and Tresor, Klockwords and Delsin. Reinterpretations by Ricardo Villalobos and Marc Romboy to name a few, proved a big hit with fans and fellow artists. His schedule takes him on a tour past the world’s finest clubs: from Berlin’s Berghain to Tokyo’s Womb, and from Output in New York to Club Rex in Paris. We’re very excited to see – and hear – what kind of techno madness he has in store for us. Pfirter is one of Argentina's finest techno exports. Pushing a sound that is at once dark and uplifting, old school and fresh, he's gradually evolved into a club music all-rounder, DJing, producing and running one of techno's brightest imprints, MindTrip. He has put out massive records on the likes of CLR, Figure and Stroboscopic Artefacts, released music from Oscar Mulero, Lucy, Chris Liebing, Tripeo and Markus Suckut and performed everywhere from Berghain and Tresor to Awakenings, I Love Techno and Time Warp. 2017 sees the further development of his label with a select group of releases scheduled as well as the MindTrip Podcast. It is anyone's guess as to just how far Pfirter will continue to challenge and push himself and the wider techno scene. 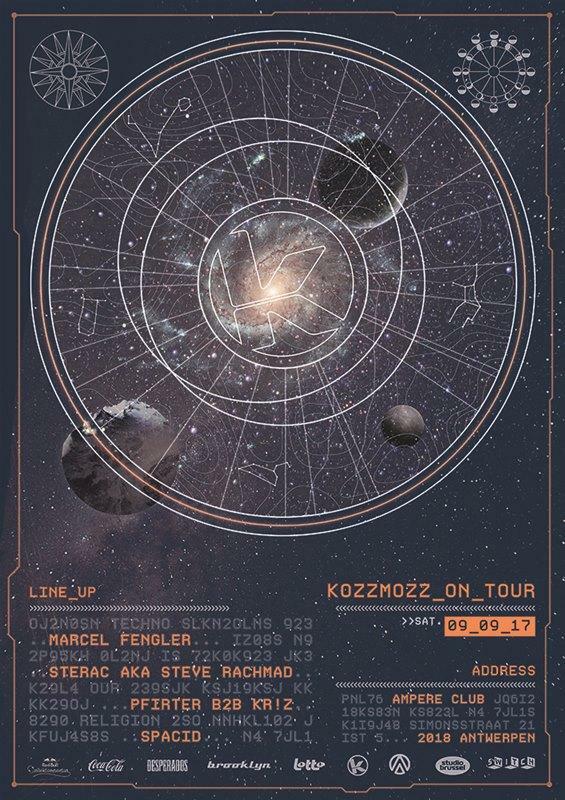 His promising B2B-set with Kr!z will definitely be a musical highlight. The latter one has been a Kozzmozz resident for a long time and made his mark as the label head of the much hailed Belgian label, Token Records. With consistent and impressive DJ-skills, and a tendency for the gloomy, dark and rawer sound of techno, he is a talented and capable artist in his own right. His busy DJ-schedule brings him all over the world, playing multiple times at Tresor and Berghain, to clubs reaching as far as Japan and Los Angeles. The night starts off with Kozzmozz’ front-runner and longest resident: Spacid. He has been promoting techno since the early 90’s but never ties down to one particular style. As founder of the Funky Green Aliens collective, he always promoted the more experimental side of techno. His thirst for renewal is illuminated by his passion for music, which keeps him sharp. This vision led him to be a connoisseur of sound, keeping him relevant as a DJ for more than 20 years.